Or I would prefer to say: I’m still there. My mind is there still, and I really would like to have more events, more things to struggle with, more problems to solve with PowerShell. Why, you may ask. The main reason for that is simple: I have no chance to do the same in my organization, at least most of “run on my PC” stuff. No PowerShell on most of boxes out-there limits my PowerShell activity to things that can be done remotely in old-fashion way (gwmi –ComputerName, and stuff like that). So that’s why I’m still playing with my SG scripts and try to make them even better. Another thing is reading thru experts approach. I actually haven’t thought about making any of entries a real module… Now that’s something to look after if you would really like to make 5-star entry. I mean the one that would get 5-stars from any judge that would look at that. Complete and easy to Import- Remove-, as long of course as you don’t get overexcited and don’t do that for beginner events. 😉 But there are some ideas (ft within script? God NO!) that I don’t like at all. They are so… VBScript-way. Finally I got my hand on PowerShell TFM. To be hones I haven’t expected it so soon. Hardly had time to read it though. Good news is that this week I will travel to work by bus/ subway and it means a LOT of time to spent on reading, one thing I can’t do if I (as usually) travel to work by car. Simple GUI app to move files away from desktop. Tired of looking at all those files at your desktop? This script is here to help you! Not only will it move all files to different location that you choose. It will also create a link for you on your desktop! With no parameters given it will move everything but links. If you want to keep some other types - let the script know, simply add -Exclude extensions. Using windows.forms.messagebox as a simple UI. Will move everything to c:temp and will not move any lnk, mp3 and jpg files. Define path to folder that will be used to store files. Write-Host "Need STA mode or ISE to launch this script"
Throw "Use powershell.exe with -STA parameter or Ise to launch this script"
Write-Host "Need WPK module (comes with PowerShellPack) to run"
Throw "Install PowerShell Pack first"
# Just in case - fix Excludes first. 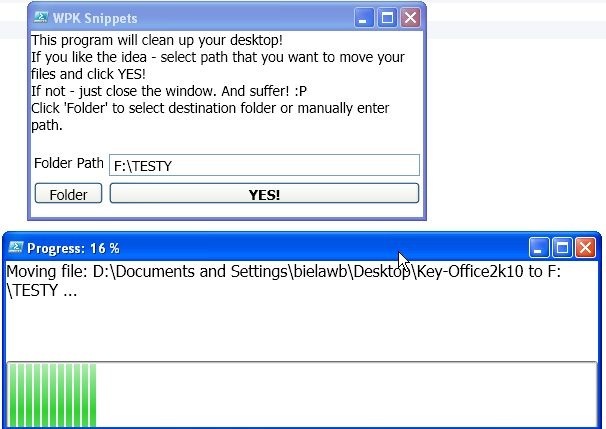 $Text = "This program will clean up your desktop!" $Text += "`nIf you like the idea - select path that you want to move your files and click YES!" $Text += "`nIf not - just close the window. And suffer! :P"
$Text += "`nClick 'Folder' to select destination folder or manually enter path." $obj = New-FolderBrowserDialog -RootFolder "MyComputer"
# No folder! No folder! Create one to move on! trow "No files to process"
$link.Description = "Automaticaly created by Clear-Desktop"
And that how it works: see? I’ve used piece of code here, and piece of code there to start with. But to make it work all together – man, that was a real challenge! And you know what? When I decided to let my wife know about SG and I’ve shown her standings after Wednesday I was sure she will be kind of angry: that I’ve wasted time I hardly have on some ‘games’. Well, it was opposite. She was… touched in a way, that I was able to get that high. She’s proud of me and that makes whole thing even better. But to add some bitter to this honey pot – you should read blog from (most likely) winner of whole SG contest this year. Some good point there about judging mainly that I have to agree with, seen here. After all – how can one care much about ‘stars’ if those stars are meaningless without feedback? To be honest I hate those long weekends. It’s fine if you have enough days off to travel somewhere, but if you stay at home it’s usually matter of weather, and you can rely on weather in May. This year it’s really bad here in Warsaw, so there is no way I can go out with children and have some fun – we have to stay at home. I also noticed that after last week and Scripting Games fever I’m really in a mood of writing scripts all the time. I even went for beginner events yesterday to do something. To make it almost-a-challenge I’ve done all script in VBS. And it was not that bad. Maybe I will try to do advanced in VBS too, who knows? Two things I would like to share today: first that jobs are not that bad as I thought. It took me a while to get familiar with them, but in the end (in my opinion) it went really fine. Second: I’ve noticed that ISE is really nice tool (misses some functionality I like in editor from PowerGUI, but is adding some other that I could not find in latter). And you can extend it using some packs that are already out there. Such as part of PowerShellPack, IsePack module. Importing it is now in first line of my Microsoft.PowerShellISE_profile.ps1. One of features it adds is “Copy-ColoredAsHTML” ([ctrl] + [alt] + [shift] +c). I guess I will use it to add code to my posts. It’s really annoying with other tools that I’ve found. And with that I have to only tweak a HTML code a bit and I get something really readable and easy to follow. Name of the computer which will be tested. Switch to enable background jobs. Write-Verbose "Started job for computer`: $_computer"
Write-Verbose "$_computer is not accessible"
Name of the computer to which object relates to.